It's your friendly neighbourhood Spider-man! 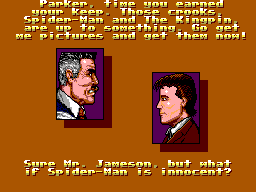 Only apparently not as Kingpin frames Spider-man as a terrorist who has hidden a radio-active bomb on the harbour that will detonate within 24 hours. Although the plot holds water like a sieve, the common plebs seem to believe this and call for Spider-man to be arrested. It's up to you to clear your name and beat up the bad guys! Probably not in that order. The game engine is one of the most polished on the system. The web slinging in particular is very well made and very satisfying to play. 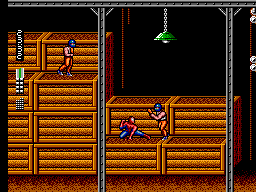 It controls well and the different attacks do varying ammounts of damage, so kicking a bad guy from swinging off a web does the most damage out of any of your attacks whereas just tapping punch does very little. Where the game suffers though, is the monstrous level design. Although the design is very good, even the first level can prove a rather frustrating challenge as you have to enter through the open window and the game seems rather particular on which BIT of the window you have to enter from. Then the already fairly steep difficulty curve takes a rather drastic turn skaywards when you hit the Power Plant level. Without some amazing observation skills, plain luck or being told what to do, you will struggle to figure out why exactly you keep getting blasted by lightning storms when you try and climb the level. You also have one life, so even small blunders can cost you big which adds to the difficulty of the game. However, after this point in the game, the difficulty quite quickly slips back down to the realms of reasonable again and the rest is pretty straight forward. Monstrous difficulty aside, this game plays very very well. Definitley one of the best Master System games in terms of game mechanics. The graphics are, again, one of the better graphics for the system. Good, large and quite nicely detailed sprites. 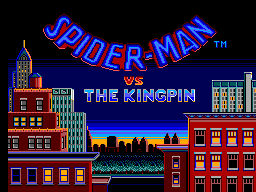 Spider-man himself seems pretty well animated and the back grounds are richly coloured and detailed as far as the Master System goes. I've seen games struggle with less which points to some very good programming and design behind this game. The sound effects and music are really nothing exceptional, but they are not bad either. No frustratingly annoying bleeps or over the top sound effects going on here. It's all functional and low key. The music isn't exactly inspiring stuff either but functional. It's all good, but nothing amazing or exceptional going on here. The game controls well, as already mentioned. The web slinging mechanics work very nicely and are quite easy to control. Aiming your flying kicks from a web sling takes some practice but pulling it all off makes you feel pretty awesome and when you pull it off nearly every time you feel all that more amazing, like Spider-man! The only real gripes I have with the controls are trying to hit the 1+2 buttons together to load up the camera or the amulet that takes you pack to safety. It says you hit them both together but I find hitting 1 quickly followed by 2 works far better. The wall scaling also seems a little temperamental at times and being unable to recover from being hit from a great height by web slinging is a real shame as that would have been a really cool addition and could have allowed some very interesting options for airbourne boss fights (not that the difficulty level of this game needed much in the way of encouragment). I find this one hard to judge in terms of replay. Seeing as the hardest point in the game is quite early on and it is so frustratingly hard it borders on the realms of completely unfair. It can be too much, too soon for less patient players, but for more dedicated gamers, the biggest challenge in the game is beaten too soon and the rest of the game is rather easy in comparison. For those people though, there are the harder difficulty levels. So perhaps more replay value for the more determined gamer. If the power plant was later in the game, I would say this had a lot more replay value as you would have a good few levels to swing around and have a lot of fun in before being contronted by the demon that is the power plant level, but with the way things are, the fun stops too soon for some mindless web slinging self indulgence. Real shame too as the mechanics for the web slinging are fantastic! A well constructed game through and through. Graphically and gameplay wise, it really shows what the Master System was capable of. The only real fault I can pick with the game is the power plant level as it is so frustratingly difficult to figure out what you are meant to do and far too soon in the game to leave a rewarding feeling of reaching that point. It definitley deserves merit for everything else though as this is an excellent game.